At the Pavilion, our $1.6 million, state-of-the-art ice system creates a smooth, professional, and sustainable surface available for a variety of great ice activities. Take a lesson, bring a friend, or go on your own during our public skate times. 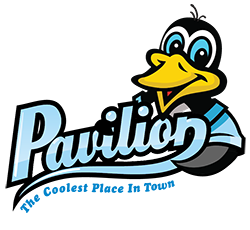 The Pavilion offers a variety of ice skating lessons all year long. Explore the options below to learn more. Learn how to skate through the US Figure Skating’s Learn to Skate USA. Cost: $100 for county citizens; $125 for out-of-county citizens (Skate rental and eight practice times are included in this cost). Requirements:All skaters must register with Learn to Skate USA to participate. Visit learntoskateusa.com to register and affiliate with the Pavilion Skate School. Registration year is July 1st – June 30th. A $16 fee is due at the time of enrollment. Registration Deadline: One week before the start of the session. Schedule: 30 minute classes meet on Mondays for eight weeks. Refer to the options below for times. Curriculum: Learn standing, the proper way to fall and get up, marching forward, two-foot glide, dip, backward wiggles, rocking horse, forward one-foot glides, forward swizzles, backward swizzles, snowplow stop, and forward slaloms. Curriculum: Basic Skills teaches the FUNdamentals of ice skating and provides the best foundation for figure skating, hockey, and speedskating. Six progressive levels introduce forward and backward skating, stops, edges, crossovers, and turns. Curriculum: The Youth Basic Skills are adapted for adults. If you want to learn how to ice skate at your own pace, consider taking a private lesson. No matter your experience, a private lesson can help you hone your skills and become an even better skater! 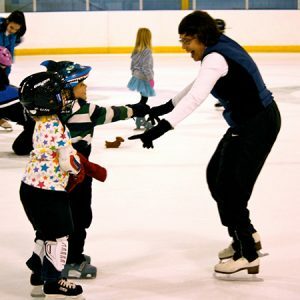 To find an ice skating coach, visit isk8greenville.com. Students must purchase ice time during their private lesson. 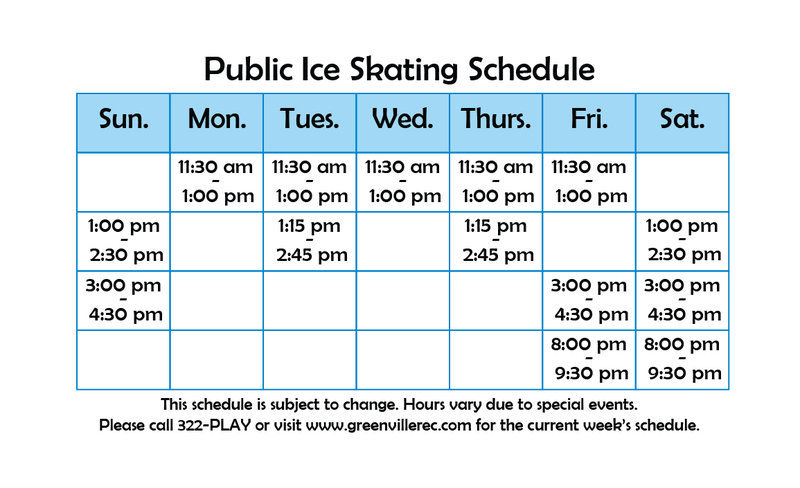 For available skating times, view our Freestyle Skate Schedule. To learn about costs, session rules, scheduling, or other important information, contact our Learn to Skate Customer Service Coordinator at 864.322.7529 X 203.